I woke up this past Saturday with a knot in my stomach – I had been dreaming that our landlord had just told us he was raising our rent to an amount we couldn’t afford. Once I was awake enough to realize it was just a dream my stomach calmed down, but it turns out the dream was a foreshadowing: We learned yesterday that our landlord will be selling the house. It will probably be listed in early September. I can’t say I am entirely surprised – he got divorced within the last year and we thought there might eventually be financial reverberations coming that involved the house. Our rent increased slightly this year, and while we were not entirely happy about it the house remained affordable, especially since all utilities are included in the rent. Houses typically take a l-o-n-g time to sell here, and our lease has to be honored no matter when the house sells. Our landlord is giving us first refusal on buying the property, but we frankly can’t afford it. Even if we could we have no desire to deal with the maintenance this place requires, and have no interest in being landlords either. Our lease allows us to stay through the end of next May, but after that there is no way to know if a new owner (assuming the house has sold) would maintain the current set up. The most likely scenario is that the rent will go up but will no longer include utilities. Our gut feeling is that we should start looking for a new place to live sooner rather than later. However, after crunching a lot of numbers yesterday evening, Brett and I think it’s time to consider buying rather than renting. We have decided to contact a realtor next week and find out just what we can afford and what’s available. With WenYu heading off to college next year and YaYu following in just two more after that, we won’t be needing as much space as we do now, and a small condo would give Brett and I someplace solid to live as we grow older. We wouldn’t have to worry about external maintenance (just those HOA fees! ), and we wouldn’t have to worry about the rent going up or the house being sold out from under us. Owning our own place would allow us to consider things like house swaps and such when we travel, something we can’t do in a rental. 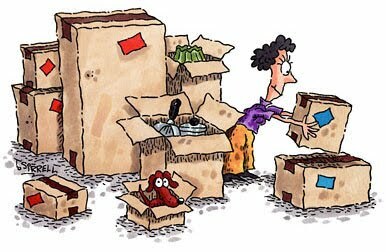 Finally, moving to a smaller place would also give us an opportunity to downsize a bit more. Still, all of us are feeling very, very sad right now because we genuinely love this house, and honestly thought (hoped) we could live here for several years. It’s been a perfect home for us in every way as we have settled in and made Kaua’i our home. The location is wonderful, the views from our windows beautiful. We have known all along though that having to move was always a possibility, but we just didn’t think it would happen so quickly. Previous Post Sweatin’ To the . . . Everything! So sorry to hear this news. Not what you planned for sure. Definitely not what we had planned but maybe it’s for the best. Like you, I think things happen for a reason, so we’ll see what happens. So sorry to hear that you have to move. Hopefully it will work out for you to buy a condo and a year from now you will be saying that you are glad this happened. I love that this opens you up to home exchanges. Occasional Nomads can make this work out well. That’s what we hope as well – that in a year we will be glad to be out of here and living in a new place we can call our own. We’ll see. Owning our own place here would definitely be more advantageous for our travel plans. Yikes! I know you really love your house, but hopefully you will find something that works with your occasional nomadic lifestyle! This really was an unexpected. The good thing though is that time is on our side – it’s not like we have to move in a month or something, and have to scramble to find something. We have until the end of May next year, so hopefully between now and then we’ll find something that works for us, whether it’s buying someplace or finding another rental. Yikes!! Not the news I was wanting to read. Yes, homes take a long, long time to sell here, including condos. The only price point selling is in the $300,000’s. I watch condos up to $400,000 and notice HOA fees are continually climbing, I watch single family homes up to $500,000. Some HOA fees are now approaching $800 a month and that’s not for fancy places either. Lihue has some more reasonable condos than south or north shore. Kapaa has the Sportsman condos above Kealia beach that are reasonably priced but I notice their HOA fees are in the $700 range, at least they have a pool and tennis court. The HOAs at some of those places are outrageous, and they put a lot of otherwise affordable condos out of our price range. We’re definitely going to be looking in Lihue and Puhi, but there are condos up on the eastside that might work as well. The north shore? Forget it. I’m always looking at Hawaii real estate. The condominium fees are outrageous in most cases. Hope you get lucky and find something affordable. There are some here that aren’t too bad. Bad, yes, but not unaffordable. I think it’s worse in Honolulu. What’s particularly a surprise here is how low property taxes are. We’ll find something . . . time is on our side. Good luck on finding something that works for you. Luckily you have some time to look around. Yes, we are lucky to have so much time. I can’t image where we’d be if we only had 30 or even 60 days to find a new place. The rental market is very tight here. Big changes ahead! I like the idea of a condo that you can leave (or fill) while you are traveling. A bit more secure? HOA fees keep us away from condos on the East coast. If you have it “rented out” while you are gone, it could be a net gain. You have a long timeline. I bet you will find something lovely by then! One other thing to note about condos is the condition of the property and the building itself – the board can sometimes approve mandatory fees for renovations – which might be avoidable in a newer, well-maintained location. I love you were able to live a year and get used to the area before jumping into buying something. That is worth a lot when you relocate to a new state. Hawaii is like no other state in the U.S. It really is a culture shock. I think it’s great since in the future you plan to be away for months you can rent the place instead of paying rent on an empty place.